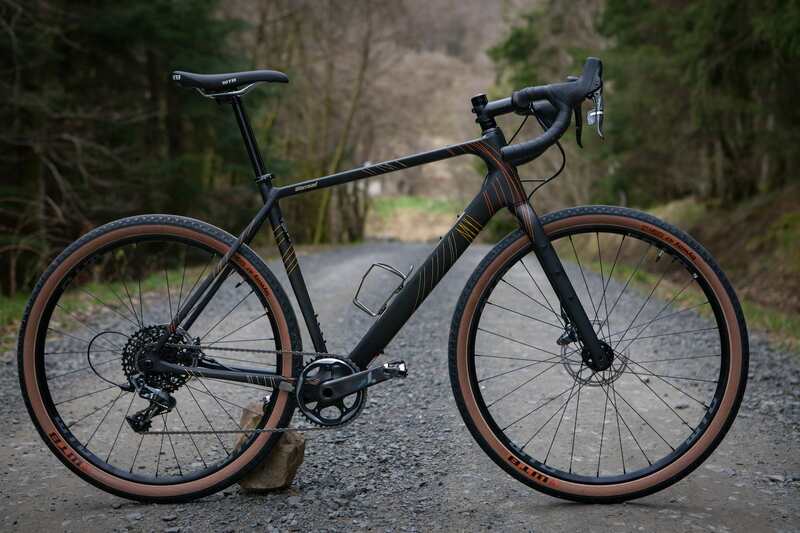 It would be unfair to Canyon to say that they have neglected the ‘cross and gravel market until this year, but in comparison to their road and mountain bike range, there seemed to be a gap at the top of their ‘cross line up – a true no compromise carbon race whippet. Not ones to do things by half, the German direct to consumer brand have stepped up in style with a designed-from-the-ground-up bike that is as distinctive as it is new. Looking something like a genetically modified cut and shut between angry hornet with a stooped back and a hammerhead shark, the Inflite is certainly divisive. Whether you are fan or not, it’s hard to deny that the bike doesn’t look purposeful. In fact it looks fast sitting still, with the racey yellow graphics (a more subtle black and grey is available), those integrated aero bars and heavily shaped carbon lines. Lets start with the obvious. That kinked top tube has a number of theoretical advantages. Firstly, with a wide base, it is intended to be comfortable and secure for shouldering mid-race. A bit of extra top-tube clearance is rarely a bad thing either. Finally, as the seat tube comes to a halt at the low top tube interface, the Inflite features a long and slender seatpost. There’s some good logic behind this. Smaller triangles are stiffer than big ones. Stiff equals good for power transfer on a race bike. Stiff is less good for comfort, or even the ability to apply that power while seated. Luckily, the long seatpost should more than counter any excessive frame stiffness. As the seat tube comes to such an abrupt stop, there’s no room for a traditional clamp. Canyon have integrated this into the frame, with a hex bolt accessible under the toptube. It even comes with a wee rubber grommet to keep things clean once adjusted. The claimed weight of the frame comes in under the magic 1kg at 940g. Canyon say this builds up to a total bike weight of a smidge over 8kg for the medium size that we’ll be testing. We’ll get the scales of truth out before the bike gets too muddy. A huge bottom bracket area adds to the frame’s torsional stiffness, with slender seat stays adding some give and bucketloads of mud clearance. 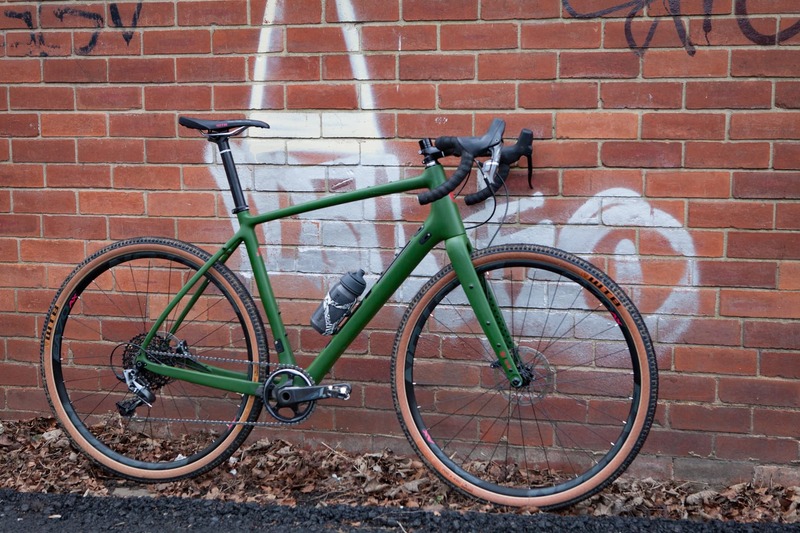 There is less clearance around the chain stays – this is definitely a ‘cross bike rather than an “adventure bike”. We’ll check whether 40mm tyres clear, but it’s likely to be tight. Both front and rear axles are bolt through, and of course the frame is disc-specific, using direct mount fittings to keep things as tidy as possible. Speaking of tidy, cable routing is all internal, keeping the mud away from anywhere that it may cause trouble. Those forks are full carbon (natch) with more than enough clearance for the worst supermodder. Despite this, the legs are chunky and built to resist any twisting forces that may be transferred from the brakes. We’ll see. Getting the easy stuff out the way first, the Inflite is a SRAM party when it comes to gearing and braking. Full hydraulic Rival1 throughout, with a Quarq Prime crankset (still owned by SRAM). It is possible to run a front mech via a bolt on plate (provided), but on this 1x build, a custom chain catcher is included on the boxed build. In our not so humble opinion Rival (or Ultegra/105 should you prefer the other “S”) makes for the perfect ‘cross racing groupset. Performance is virtually as good as the top end Force/Dura-Ace options (especially once coated in mud), but is less heartbreakingly expensive to replace should that mud claim the rear mech. Upfront and up top the Canyon H31 Ergocockpit (yes, really) CF is an integrated bar/stem combo. Smooth lines flow from the “stem” to flat topped bars and a shallow drop. It’s an obvious point, but one worth making, that this makes size fine tuning a little tricker than with a regular stem. It does look pretty hot though and more importantly – as I’m sure Canyon would be keen to point out – is more aerodynamic, more comfortable and lighter (at 335g) than a more conventional set up. Canyon also supply the 27.2mm carbon seatpost, upon which a Selle Italia SLS sits. DT Swiss CR 1600 Spline DB wheels are a solid option – lightweight (just how lightweight, we’ll confirm for ourselves) and tubeless ready. While the diehard racers will be swapping them for tubs come race day, more and more riders are using the halfway house of tubeless – giving more flexibility and easy transition between racecourse and trail. Our wheels were kindly set up tubeless by Canyon before shipping, with Schwalbe X-One 33mm tyres. After a summer mostly on 40mm gravel tyres, these look wildly skinny, but should be perfect for cutting through autumnal slop. Ready for action. The DT Swiss/Schwalbe combo will run tubeless. At £2,499, the Inflite CF SLX 8.0 Pro Race is actually the entry level of Canyon’s carbon ‘cross bikes. For an extra £400 you get Ultegra and (2x) Rotor cranks on the Inflite CF SLX 9.0. Finally, the top end Inflite CF SLX 9.0 Pro Race runs full Force CX1 and Reynolds Assault carbon wheels. You’ll have to reach deeper into your jersey pockets for that though. Full retail is £3,599 – astonishing value once you start totting up the price of components. For hitting the ‘cross course, though, we reckon the smart money is on our 8.0. We’ve got used to and fallen in love with simplicity of 1×11 and a wide range cassette, and while those Reynolds wheels look very spanky, most serious ‘cross racers are likely to have their own preferred tubular wheelset. More by bad luck and a busy calendar than design, Tom has missed every round of local CX races so far this season. The Inflite is the excuse that has been needed to dust off the skinsuit, do a little training and rock up woefully underprepared and overbiked for the last round or two. Classic. There are no excuses with Inflite, so any performance deficit is likely to be down to the pilot. Nevertheless, he’ll be trying his best and reporting back with how the bike has performed come January. 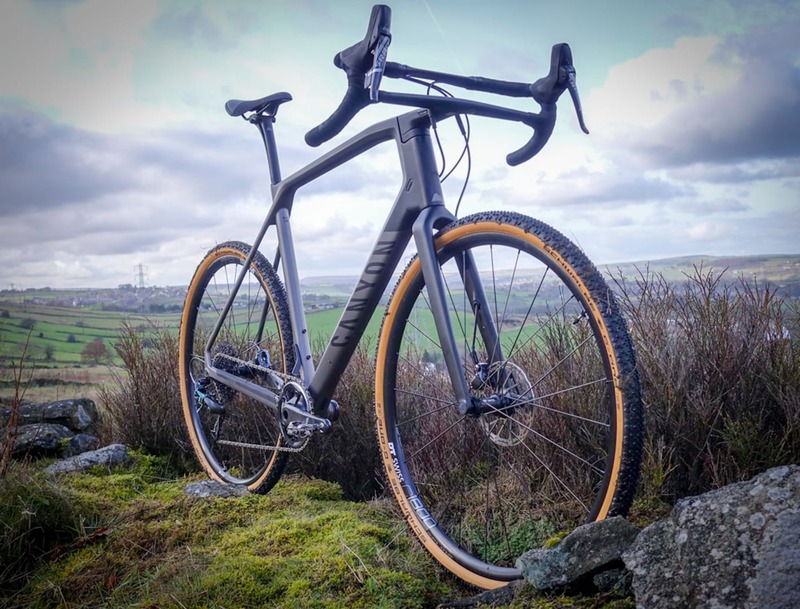 Review: Canyon’s high-falutin’ carbon gravel bike – the Holy Grail? Or just a carpenter’s cup? First Look | Kona Libre DL – understated, but not to be underestimated?